Available Now! Charming home in the heart of Chula Vista. Very affordable and in a nice location. Bedroom is in the back of the home, living room is at the front. Nice kitchen includes refrigerator and gas stove. At this price, this home will sell fast. Call to see today. Move-in ready! This 3 bedroom 2 bath home in the heart of Spring Valley with Bamboo floors and stainless steel appliances in a quiet all age park. Priced to sell fast. Call today to schedule an appointment to view. Absolutely charming home in a 5 Star all age community! Large living room facing the stunning view! Kitchen is darling and includes beautiful cabinetry and counter tops; refrigerator, stove and microwave oven are included. Spacious dining area, indoor laundry closet with washer and dyer included. Good size bedrooms and bath. Enjoy your morning coffee on your own private deck. Dream fenced back yard with stunning views! Large custom made storage shed/workshop. Homes like this are rarely available, call to see today! You will be proud to call this your home! Splendid 2001 Skyline manufactured home. Well planned split floor plan with bedrooms at each end. Gourmet kitchen with beautiful granite counter tops, breakfast bar with overhead cabinetry and gorgeous black deep sink. Newer top of the line stainless steel 4 door/drawer refrigerator and stainless steel dishwasher. Large living room with ceiling fan and dormer window. Great dining area, indoor laundry room and rich wood laminate floors in living areas, newer carpet in bedrooms. Master bedroom features private bath with deep garden tub, dual sinks and separate shower stall. Extended carport to fit 4 vehicles. Central air for those hot days, custom storage shed, deck and fenced yard. Space rent $795. This one will not last as 4 bedroom homes are hard to find. Serial No. 23710158PBA. Stunning 1560sf home in the highly sough after senior community of Bonita Hills Estates. Stunning home with amazing floor plan. Beautiful kitchen with breakfast bar, ceramic tile counter tops, can lights and all appliances are included. Amazing views can be enjoyed from the formal living and dining rooms. The den is across from the kitchen, and it will make the perfect office/pantry. Enjoy your favorite shows in the comfort of your family room. Your guests will enjoy the beautiful guest bedroom with mirrored closet doors and a spacious guest bathroom. Master suite is a dream come true; large walk-in closet, private bathroom with tile counter tops, garden tub, stunning tiled walk-in shower, vanity and dual sinks. Indoor laundry room with washer and dryer included. Large deck to enjoy your morning coffee. Fantastic cul-de-sac location, breathtaking views and amazing sunsets can be enjoyed from your large backyard. Tangelo, orange, plum and ficus trees surround the gorgeous yard. Newer items include central air conditioner, furnace and water heater. 6 panel doors, vertical blinds, drywall throughout and security screens in both main entry doors. Wood laminate flooring in kitchen, family room and master bedroom. Ceramic tile floors in bathrooms and laundry room. This is a one of a kind property. Call to see today as it will sell fast! Very upscale senior community. Absolutely stunning 2011 manufactured home in a gated all age community. Wood laminate flooring, dual pane windows, large living room. Gorgeous kitchen with all appliances included. Master bedroom features walk-in closet and private bathroom. Spacious guest bedroom and bath. This community is conveniently located near Highway 805 and 94. Excellent price for a newer model home! Highly sought after Highlands senior community! This home has the perfect location within this community; corner lot, adjacent to clubhouse and swimming pool. Well planned floor plan offers a spacious living and dining rooms. Beautiful kitchen includes all appliances and an island which includes a stove top and a breakfast bar. Family/bonus room is the perfect room to entertain. Enjoy your morning coffee or dining "outdoors" in your own enclosed porch. You can also enjoy the view from the enclosed porch and the front deck. Master suite is a dream; it features his and hers closets with mirrored doors, and a private bathroom with a garden tub, separate walk-in shower and a linen closet. Guest bedroom has access to the guest bathroom. Indoor laundry room with newer washer and dryer included. Central air and heat, storage sheds, low maintenance yard and newer carport awning. This home is priced to sell fast! This community welcomes people of all ages. This home has one of the largest backyards available! 2 bedrooms, 1 bathroom. Bamboo flooring and ceramic tile flooring. Spacious living room, dining room and living room have a view of the open space trees and highway. Homes in Bayview Mobile Home Park sell very fast. Call to see today! Gated community about 7 miles from downtown San Diego off Highway 94 and Kelton Rd. Planned Social Activities, Gated, On-Site Staff, Boat/RV Storage, Laundry Facilities, Library, Clubhouse, Billiards Room, Sauna, Spa, Recreational Facilities, Swimming Pool, Off- Street Parking. Pride of ownership shows throughout. Full drywall walls and carpeted enclosed porch will make the perfect home office or hobby room. Large front living room, inviting dining area with built-in hutch. Beautiful kitchen features an island/breakfast bar with built-in stove top. Ample cabinet/counter space, side by side refrigerator, dishwasher and oven. Family/Bonus room is perfect to catch your afternoon tv shows. Master suite features a private bathroom. Spacious guest bedroom and bathroom. Indoor laundry room with washer and dryer included, whole house water softener and drinking water filtration system. Newer items include the furnace, central air conditioner, water heater, dual pane windows and more. Extended carport with room to roam. Beautiful private patio behind enclosed porch. This is the home you have been waiting for! Call to see today. Tastefully remodeled with rich wood laminate floors. Exquisite kitchen with beautiful granite counter tops, plus cabinetry and storage galore. Breakfast island with granite tile too! Modern dining area with large windows. Spacious living room is perfect for entertaining. Master bedroom features a huge walk- in closet plus a private bath with walk- in shower, granite counter top and large linen closet. Very spacious second bedroom plus a smaller 3rd bedroom perfect for an office or hobby room and 2 bonus rooms. Large guest bathroom, indoor laundry area. Tons of storage/closets throughout the home. Newer water heater and furnace recently installed. Envision yourself living in this beautiful Country Style all age community that has a lot to offer. Large swimming pool, hot tub, BBQ area, very nice and spacious club house, pool table and more. Very close to shopping and dining. S2605X/U. Charming home in excellent condition! Lots of natural light, wrap around covered deck and large yard. White kitchen includes all appliances, washer and dryer are also included. Live comfortably in this beautiful well cared for home. Large living room and separate dining room. Master bedroom features a private bathroom. Guest bedroom and bath as well. This home is located in a very active senior community, swimming pool, library and clubhouse are there for your enjoyment. Space rent includes water, trash and sewer. Space rent amount will be available soon. Call to see today for it will not last! Large living room, 2 bedrooms + 1.5 baths. Dining area, kitchen includes refrigerator. Master bedroom has a 1/2 bath. Large deck to enjoy your morning coffee, nice patio with an orange tree and two storage sheds. Great location within this community at the end of a dead-end street. Conveniently located in the heart of Chula Vista, close to shopping & dining. Call to see today, it will sell fast. Serial No. Unobstructed ocean views and breezes can be enjoyed from your own view deck! Fantastic floor plan with a panoramic city view to the south, and breathtaking ocean views to the west. Exceptional location within this community. Huge shade trees & beautiful landscape/rockscape. Large living room with picture windows and newer glass sliding doors. Dining area with built-in hutch, beautiful kitchen with ample cabinetry/counter space. Master suite features a private bathroom and mirrored closet doors. Guest bedroom, guest bath with shower/tub combo. Large driveway, beautiful storage shed. This home is gorgeous inside and outside! Seller has lovingly cared for this home and pride of ownership shows throughout. Enjoy your coffee on your own front porch, and enjoy the afternoon breezes. Front porch entry leads you into the spacious living room. Formal dining area, kitchen has beautiful cabinetry and counter tops. Refrigerator, stove and dishwasher are all included. Indoor laundry room with washer and dryer included as well. Master bedroom features a private bathroom. Spacious second bedroom and second bathroom. Home was just painted and looks amazing. Dual pane windows, newer water heater, carport for two vehicles. This home is ready for a new owner! Call to see today. Wow! Completely upgraded inside and out. Newer stainless steel kitchen appliances and granite countertops with breakfast bar, central A/C, outside covered in cement board siding to keep inside cool in summer and warm in winter. Electric fireplace, newer carpeting with extra thick padding, laminate floor in kitchen, upgraded ceiling fans in every room. Master bedroom is huge! The hot water heater was moved outside to put stacking washer/dryer in that space. Front doors are french doors with blinds built inside glass, newer porch. Patio space on driveway side, and huge yard with mature fruit and palm trees on other side. All newer vinyl windows. Full bath has a walk in shower, second bedroom has half bath inside. This is a beauty and won't be on the market long. Absolutely charming home! Very spacious 12'x20' bedroom. Bonus room was used as a sewing room and has beautiful built- in cabinetry throughout, it would make the perfect office/hobby room. Kitchen is light and bright, includes all appliances and features ample cabinet/counter space. Large pantry and spacious storage closet sit side by side in the hall. 10'x20' living room, entry room can be utilized as a dining room or foyer. Upgraded vinyl dual pane glazed windows, central heat and air. Washer and dryer are included as well. 4. You will love the large fenced yard! All age community close to Highway 94, 54 and 125. Call to see today, this home won't last! $261 HOA includes basic cable, water, trash and sewer. This home has been well cared for and is move-in ready. Fantastic floor plan with a spacious living room, family/bonus room is perfect to be utilized as an office or a hobby room. Dining area features a beautiful built-in hutch to store your china and keepsakes. You will be amazed by the beautiful kitchen which offers granite counter tops, white cabinetry, ample counter space and a large pantry. Newer items include sink, faucet, living room carpet, central air conditioner and beautiful white wooden shutters. There is an enclosed porch ready for you to relax in; in addition, a covered deck is perfect for you to enjoy the beautiful weather. Master suite boasts a private bathroom, walk-in shower and large closet. Guest bathroom with walk-in shower and linen closet. Spacious guest bedroom, storage closets. Fenced yard, beautifully manicured yard and two storage sheds. Central heat and air and a wall ac unit in enclosed porch. Recapped roof and earthquake bracing. Lily Pigg ~ REALTOR, SFR, SRES. Rock Solid Real Estate Co. BRE Lic #01927451. Most charming home in this beautiful all age community! Pride of ownership shows throughout the home. Large main bedroom has a door to access to the beautifully landscaped back yard. Large highly productive avocado tree, lawn, flowers and plants are on sprinklers and drip irrigation. Spacious living room plus enclosed porch. Eat-in breakfast, all appliances included. Front porch entry, recapped roof, wall ac units. Corner lot with well manicured landscape. MOST CHARMING HOME IN THIS BEAUTIFUL ALL AGE COMMUNITY. This is a great opportunity for someone looking to upgrade a home with their own personal touches. Excellent floor plan with front living room. Spacious kitchen, formal dining area, bonus room. Indoor laundry room, deck to enjoy your morning coffee! Fenced yard, open space view. Excellent location within this senior community. This community holds many activities throughout the year. Swimming pool, clubhouse and lush landscape can be found in this beautiful park. Space rent $815. Investor opportunity! Similar home in the same community in excellent shape just sold for $79,900. 2002 Fleetwood Manufactured Home. Fixer upper but it will make a great home. 3 bedrooms, 2 baths. Split floor plan with master bedroom and bath at one end of the home, 2 more bedrooms and one bath at the opposite end. The home will need all new flooring, new appliances, paint, some cabinetry repair and a few other items. Fantastic deal on this beautiful manufactured home. Conveniently located right off Highway 8, near Viejas Casino and Outlet Center. Albertsons, Starbucks and other shops and restaurants are near by. 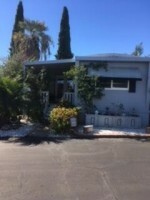 Beautiful and well cared for manufactured home includes all kitchen appliances. Great kitchen offers a breakfast bar. Very spacious living room, dining area and indoor laundry room with washer and dryer included. Beautiful wood laminate flooring in living areas and hall. Master bedroom offers a private bathroom. Newer furnace and central air unit. Enjoy your morning coffee on your own deck. Great location within this community, all ages welcome. This home will not last! BEAUTIFUL HOME IN ALPINE - ALL AGES WELCOME. Very spacious home with great floor plan. Huge living room in addition to the family/bonus room. Central air conditioner, indoor laundry room with washer and dryer included. Large kitchen with ample counter/cabinet space. Separate dining area, guest bedroom and bath. Master suite features a private bathroom. Community offers a swimming pool, a hot tub and a beautiful clubhouse. Conveniently located near two elementary schools, public park, hiking trails, lakes and shopping. Large deck to enjoy your morning coffee or dinner outdoors. Storage shed and large driveway. Homes in this gorgeous community sell fast. Fantastic school district as well! IN THE HIGHLY DESIRABLE GREENBRIER COMMUNITY. Absolutely stunning high end home with shingle roof! You will be proud to call this your home. You won't find many homes with a 2 car garage. Gourmet kitchen features granite counter tops, island, stainless steel appliance package including a side by side refrigerator and high end cabinetry. Gorgeous wood laminate flooring. Master suite offers a private bathroom with a garden tub. New items include windows, flooring, bathrooms, kitchen. Enclosed porch makes a great addition to your living space, and it would make the perfect office/hobby room. Tastefully upgraded home! This home is located within the upscale gated community of Ocean Bluffs. Just a few minutes from the ocean, enjoy ocean breezes throughout the year. You don't have to sacrifice luxury living when downsizing, this is the home your have been waiting for! Call us to see it today. Newer homes in this community don't come on the market often. All this home needs is new carpet/flooring. This home has 2 bedrooms and a large den with door. Master suite features a private bathroom. Large living and dining rooms. Fantastic breakfast room. Large kitchen with ample counter/cabinet space. All appliances are included as well. Indoor laundry room with washer and dryer included. Cathedral ceilings, ceiling fans and lots of natural light! Fenced yard ready for your pet, central air conditioner and beautiful storage shed. Front porch entry with newer carpet. This is a fixer upper home. Lately, upgraded homes have been selling between $150,000 and $287,000 for similar year and size. Co-op community, membership included. On May 19, 2010, the resident/owners of the association purchased the land and existing structures. This is the perfect home for someone looking to live in this high end community and don't want to pay the high price for a remodeled home. Make this yours and upgrade it the way you want. Also, great for an investor/flipper. Large 1440sf home, re-capped roof, central air. Master suite with private bathroom, indoor laundry room. Come make us an offer! Fantastic deal on this home. Water, trash and sewer are included in the $715 space rent. Newer white appliances, breakfast bar, light and bright. Indoor laundry room with near new washer and dryer included. Master bedroom has a convenient walk-in shower. Spacious living and dining rooms. Handicap ramp, central air conditioner, large lot and many other features. Call today, homes in this community sell fast! INVESTORS WANTED! This home is a fixer upper with tons of profit potential. 2004 Champion with about 1288sf. Great floor plan with large kitchen, dining area and very spacious living room which features a beautiful fireplace. Interior pictures coming soon. Broken items are; some missing doors, broken sink in hall bathroom, missing/broken door frames, holes on doors, damaged carpet in bedrooms. It also needs interior paint throughout. All appliances are included with the home and seem to be in good shape. Indoor laundry room, central heat and air, fantastic fence yard with awning and retaining wall. Front porch entry with redwood deck! Call to see today! Fantastic 1440sf manufactured home in a highly desirable all age community! Great split floor plan with bedrooms at each end of the home. Spacious kitchen with breakfast bar and all appliances included. Very large living room with lots of natural light. Separate dining area with built-in hutch. Large laundry room with clothes folding table. Beautiful master suite with private bath, offering a garden tub and a separate shower. Guest bathroom is spacious as well. Deck, central air, breathtaking views and large storage shed. This is a must see home! Homes in this beautiful community sell fast. Call to view! This home was nicely remodeled. 1440sf of beautiful living space. Wood laminate floor throughout. Master bedroom features a private bathroom. Spacious kitchen with stove, refrigerator and dishwasher included. Large living and dining areas. Remodeled bathrooms, low maintenance landscape. Fenced yard, concrete all around. Homes in this community sell fast. Call to see today! Beautiful views! Your new home offers a large open floor plan with lots of extra space for all your keepsakes. Living room and formal dining areas have a great view of the valley. This home features two bedrooms and two baths. Guest bedroom has two large closets and lots of storage space,guest bath has a walk in shower. Master bedroom and large master bath en suite features a tub/shower combo. A unique room off the kitchen may be used as a den/hobby room and features a sliding glass door leading out to a great outside deck, for relaxing in the afternoons. Central air-conditioning will keep this home cool on warm summer days. Washer/Dryer is also included. Great club house and swimming pool. This park offers many activities for residents to join, don't miss out on the fun in this great community!